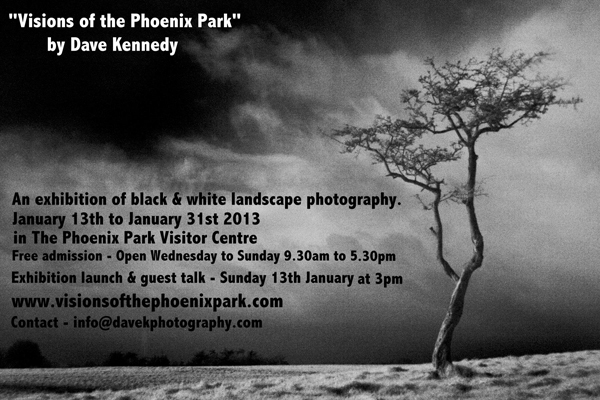 I am thrilled to announce the details of my upcoming photographic exhibition in the Visitors Centre in the Phoenix Park. The show will officially open on Sunday 13th of January 2013 at 3pm with a short talk by myself and a very special guest talk from the former park superintendent John McCullen. John is also the author of “An Illustrated History Of The Phoenix Park” which has pretty much become my bible over the last few years. You are all very welcome to come and join me. The show will run until the end of January and its totally free to visit. There will be over 40 large format framed prints in the show and copies of each photograph will also be available to purchase. I will have signed and hand numbered framed prints available to sell at the show throughout the month. The Visitor Centre is situated about halfway up the main road [Chesterfield Avenue]. If go as far as the big roundabout with the large phoenix monument on it then look out for the signpost to the Visitor Centre just before the turn for Aras and Uachtarain. There is lots of parking in there and a playground for the kids if you are planning on bringing the wee ones. Full details in the image below. This entry was posted in Black and White Photography, Phoenix Park, Photography and tagged arts, Exhibition, photographic exhibition, Visitor Centre. Bookmark the permalink. Happy New Year! Wishing you all the best for you and your family in 2013! It sounds like you will be busy until the end of the month. That is wonderful. Have a great expo and see you a next time. Happy new year to you too. Sorry its been a bit quiet here at my end, as you can probably guess I’ve been rather busy getting ready for this. I’m back now so expect at least ten posts a day [Ha]. Poolbeg Lighthouse, South Wall and The Pigeon House. Dublin Flea / Block T Christmas Cracker.